"AR Rahman" redirects here. For the surah of the Quran, see Ar-Rahman. For other uses, see Al rahman (disambiguation). Allahrakka Rahman ( pronunciation (help·info); born A. S. Dileep Kumar) known professionally as A. R. Rahman, is an Indian music director, composer, musician, singer and music producer. A. R. Rahman's works are noted for integrating Indian classical music with electronic music, world music and traditional orchestral arrangements. Among his awards are six National Film Awards, two Academy Awards, two Grammy Awards, a BAFTA Award, a Golden Globe Award, fifteen Filmfare Awards and seventeen Filmfare Awards South. He has been awarded the Padma Bhushan, the third highest civilian award, in 2010 by the Government of India. In 2009, Rahman was included on the Time 100 list of the world's most influential people. The UK-based world-music magazine Songlines named him one of "Tomorrow's World Music Icons" in August 2011. He is nicknamed "The Mozart of Madras" and "Isai Puyal" (English: the Musical Storm) in Tamil. With an in-house studio (Panchathan Record Inn in Chennai), Rahman's film-scoring career began during the early 1990s with the Tamil film Roja. Working in India's film industries, international cinema, and theatre, Rahman is one of the best-selling recording artists, with an estimated 200 million units sold worldwide. Rahman has also become a notable humanitarian and philanthropist, donating and raising money for a number of causes and charities. In 2017, Rahman made his debut as a director and writer for the film Le Musk. His fans call themselves 'Rahmaniac'. Rahman was born in Madras, India. His father, R. K. Shekhar, was a film-score composer and conductor for Tamil and Malayalam films; Rahman assisted his father in the studio, playing the keyboard. After his father's death when Rahman was nine years old, the rental of his father's musical equipment provided his family's income. Raised by his mother, Kareema (born Kashturi), Rahman, who was studying in Padma Seshadri Bala Bhavan had to work to support his family. which led to him to routinely miss classes and fail exams. Therefore, the Principal Mrs YGP summoned Rahman and his mother and told them that Rahman should focus on academics irrespective of family circumstances. Rahman attended another school called MCN for a year, and later joined Madras Christian College Higher Secondary School, where he was admitted on his music talent and formed a band with his high school classmates. However, after discussing with his mother, he later dropped out of school to pursue a career as a full-time musician. Rahman was a keyboard player and arranger for bands such as Roots (with childhood friend and percussionist Sivamani, John Anthony, Suresh Peters, JoJo and Raja) and founded the Chennai-based rock group Nemesis Avenue. He mastered the keyboard, piano, synthesizer, harmonium and guitar, and was particularly interested in the synthesizer because it was the "ideal combination of music and technology". Rahman began his early musical training under Master Dhanraj, and at age 11 began playing in the orchestra of Malayalam composer (and close friend of his father) M. K. Arjunan. He soon began working with other composers, such as M. S. Viswanathan, Ilaiyaraaja, Ramesh Naidu and Raj-Koti, accompanied Zakir Hussain, Kunnakudi Vaidyanathan and L. Shankar on world tours and obtained a scholarship from Trinity College London to the Trinity College of Music. Studying in Madras, Rahman graduated with a diploma in Western classical music from the school. Rahman was introduced to Qadiri tariqa when his younger sister was seriously ill in 1984. His mother was a practicing Hindu. At the age of 23, he converted to Islam with other members of his family in 1989, changing his name to Allahrakka Rahman (A. R. Rahman). Rahman initially composed scores for documentaries and jingles for advertisements and Indian television channels. In 1987 Rahman, then still known as Dileep, composed jingles for a line of watches introduced by Allwyn. He also arranged the jingles for some advertisements that went on to become very popular, including the popular jingle for Titan Watches, in which he used the theme from Mozart's Symphony no.25. 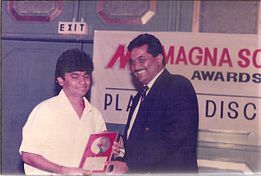 Rahman (left) receiving a platinum award at the MagnaSound Awards; MagnaSound released his first film soundtrack, Roja, in 1992. In 1992, he was approached by director Mani Ratnam to compose the score and soundtrack for his Tamil film, Roja. Rahman's film career began in 1992 when he started Panchathan Record Inn, a recording and mixing studio in his backyard. It would become the most-advanced recording studio in India, and arguably one of Asia's most sophisticated and high-tech studios. Cinematographer Santosh Sivan signed Rahman for his second film Yoddha, a Malayalam film starring Mohanlal and directed by Sivan's brother Sangeeth Sivan that released in September 1992. The following year, Rahman received the Rajat Kamal (Silver Lotus) award for best music director at the National Film Awards for Roja. The films' score was critically and commercially successful in its original and dubbed versions, led by the innovative theme "Chinna Chinna Aasai". Rahman followed this with successful scores and songs for Tamil–language films for the Chennai film industry, including Ratnam's politically-charged Bombay, the urban Kadhalan, Thiruda Thiruda and S. Shankar's debut film Gentleman (with its popular dance song, "Chikku Bukku Rayile"). Rahman collaborated with director Bharathiraaja on Kizhakku Cheemayile and Karuththamma, producing successful Tamil rural folk-inspired film songs; he also composed for K. Balachander's Duet, which had some memorable Saxophone themes. The 1995 film Indira and romantic comedies Mr. Romeo and Love Birds also drew attention. Rahman attracted a Japanese audience with Muthu's success there. His soundtracks are known in the Tamil Nadu film industry and abroad for his versatility in combining Western classical music, Carnatic and Tamil traditional and folk-music traditions, jazz, reggae and rock music. The soundtrack for Bombay sold 15 million copies worldwide, and "Bombay Theme" would later reappear in his soundtrack for Deepa Mehta's Fire and a number of compilations and other media. It was featured in the 2002 Palestinian film Divine Intervention and the 2005 Nicolas Cage film, Lord of War. Rangeela, directed by Ram Gopal Varma, was Rahman's Bollywood debut. Successful scores and songs for Dil Se.. and the percussive Taal followed. Sufi mysticism inspired "Chaiyya Chaiyya" from the former film and "Zikr" from his soundtrack album for Netaji Subhas Chandra Bose: The Forgotten Hero (which featured elaborate orchestral and choral arrangements). Rahman's soundtrack album for the Chennai production Minsaara Kanavu won him his second National Film Award for Best Music Direction and a South FilmFare Award for Best Music Direction in a Tamil film in 1997, the latter setting a record of six consecutive wins; he later went on to win the award three consecutive additional times. The musical cues in the soundtrack albums for Sangamam and Iruvar used Carnatic vocals, the veena, rock guitar and jazz. During the 2000s, Rahman composed scores and popular songs for Rajiv Menon's Kandukondain Kandukondain, Alaipayuthey, Ashutosh Gowariker's Swades, Rang De Basanti and songs with Hindustani motifs for 2005's Water. Rahman has worked with Indian poets and lyricists such as Javed Akhtar, Gulzar, Vairamuthu and Vaali, and has produced commercially successful soundtracks with directors Mani Ratnam and S. Shankar (Gentleman, Kadhalan, Indian, Jeans, Mudhalvan, Nayak, Boys, Sivaji and Enthiran). In 2005 Rahman expanded his Panchathan Record Inn studio by establishing AM Studios in Kodambakkam, Chennai, creating the most cutting-edge studio in Asia. The following year he launched his own music label, KM Music, with his score for Sillunu Oru Kaadhal. Rahman scored the Mandarin-language film Warriors of Heaven and Earth in 2003 after researching and using Chinese and Japanese classical music, and won the Just Plain Folks Music Organization|Just Plain Folks Music Award For Best Music Album for his score for 2006's Varalaru (God Father). He co-scored Shekhar Kapur's second British film, Elizabeth: The Golden Age, in 2007 and received a Best Composer Asian Film Award nomination at the Hong Kong International Film Festival for his Jodhaa Akbar score. Rahman's music has been sampled for other scores in India, appearing in Inside Man, Lord of War, Divine Intervention and The Accidental Husband. His score for his first Hollywood film, the 2009 comedy Couples Retreat, won the BMI London Award for Best Score. Rahman's music for 2008's Slumdog Millionaire won a Golden Globe and two Academy Awards (a first for an Asian), and the songs "Jai Ho" and "O... Saya" from its soundtrack were internationally successful. His music on 2008's Bollywood Jaane Tu... Ya Jaane Na was popular with Indian youth; that year, his score and songs for Jodhaa Akbar won critical acclaim, a Best Composer Asian Film Award nomination and IIFA awards for best music direction and score. In 2010, Rahman composed the original score and songs for the romantic Vinnaithaandi Varuvaayaa, the sci-fi romance Enthiran and Danny Boyle's 127 Hours, composing for the Imtiaz Ali musical Rockstar; the latter's soundtrack was a critical and commercial success. In 2012 Rahman composed for Ekk Deewana Tha and the American drama People Like Us, and collaborated with director Yash Chopra on Jab Tak Hai Jaan. all were positively received. By the end of the year his music for Mani Ratnam's Kadal was critically acclaimed, and the album topped the iTunes India chart for December. In 2013, Rahman had two releases: Raanjhanaa and Maryan. Both were successful, with the former nominated for a number of awards and the latter the iTunes India Tamil Album of 2013. The year 2014 was one of the busiest years for Rahman, with him claiming to have worked in 12 films in various languages. While his first release for the year was the Imtiaz Ali's road movie Highway which garnered positive reviews, his very next release was the performance captured animation film Kochadaiiyaan, a Rajinikanth starrer directed by Soundarya Rajinikanth. The film's score and soundtrack garnered huge critical appraise with its score being long-listed at the forthcoming Academy Awards. His next were the scores for the two back to back Hollywood films, Million Dollar Arm and The Hundred Foot Journey, both of which got into the contended list for the original score category nomination at the Oscars. This was followed by the highly successful soundtrack album for the period drama Kaaviya Thalaivan teaming up with director Vasanthabalan for the first time. His next release was Shankar's supernatural thriller I and K. S. Ravikumar's period action film Lingaa, both of which were highly acclaimed and appreciated upon release. Apart from successful soundtracks, he has also received acclaim for his background scores and is considered one of the finest background-score composers in India. His background scores are often characterised by the usage of subtle orchestration and ambient sounds. Trained in western classical music, he often employs contemporary instruments such as Guitars, Cello, Flute, Strings, Keyboard, Finger board, Harpejji, Santoor and traditional Indian instruments such as Shehnai, Sitar, Mrudangam, Veenai & Tabla to create scores. Rahman has also been involved in non-film projects. Vande Mataram, an album of original compositions released for India's 50th anniversary of its independence in 1997, is one of India's bestselling non-film albums. He followed it with an album for the Bharat Bala–directed video Jana Gana Mana, a collection of performances by leading exponents and artists of Indian classical music. Rahman has written advertising jingles and orchestrations for athletic events, television and Internet media, documentaries and short films, frequently using the Czech Film Orchestra and the Chennai Strings Orchestra. In 1999, Rahman partnered with choreographers Shobana and Prabhu Deva and a Tamil film-dancing troupe to perform with Michael Jackson in Munich, Germany at his Michael Jackson and Friends concert. In 2002 he composed the music for his first stage production, Bombay Dreams, which was commissioned by Andrew Lloyd Webber. The Finnish folk-music band Värttinä collaborated with Rahman on the Toronto production of The Lord of the Rings, and in 2004 he composed "Raga's Dance" for Vanessa-Mae's album Choreography (performed by Mae and the Royal Philharmonic Orchestra). Since 2004 Rahman has performed three successful world tours before audiences in Singapore, Australia, Malaysia, Dubai, the United Kingdom, Canada, the United States and India, and has been collaborating with Karen David on her upcoming studio album. A two-disc CD, Introducing A. R. Rahman (featuring 25 of his Tamil film-score pieces), was released in May 2006 and his non-film album Connections was released on 12 December 2008. Rahman performed at a White House state dinner arranged by US President Barack Obama during an official visit by Indian Prime Minister Manmohan Singh on 24 November 2009. He is one of over 70 artists on "We Are the World 25 for Haiti", a charity single to raise relief funds in the wake of the 2010 Haiti earthquake. In 2010, Rahman composed "Jai Jai Garvi Gujarat" in honour of the 50th anniversary of the formation of Gujarat State, "Semmozhiyaana Thamizh Mozhiyaam" as part of the World Classical Tamil Conference 2010, and the theme song for the 2010 Commonwealth Games, "Jiyo Utho Bado Jeeto". Rahman began his first world tour, (A. R. Rahman Jai Ho Concert: The Journey Home World Tour) on 11 June 2010 at Nassau Coliseum in New York; 16 cities worldwide were scheduled. Some of Rahman's notable compositions were performed by the London Philharmonic Orchestra in April 2010. In February 2011 Rahman collaborated with Michael Bolton on Bolton's album, Gems – The Duets Collection, reworking his "Sajna" from Couples Retreat. On 20 May 2011 Mick Jagger announced the formation of a supergroup, SuperHeavy, with Dave Stewart, Joss Stone, Damian Marley and Rahman; its self-titled album was scheduled for release in September 2011. The album would have Jagger singing on Rahman's composition, "Satyameva Jayate" ("The Truth Alone Triumphs"). In January 2012 the Deutsches Filmorchester Babelsberg announced that it would join KM Music Conservatory musicians for a 100-member concert tour of five Indian cities (Germany and India 2011–2012: Infinite Opportunities), performing Rahman's songs. The marked the centennial of Indian cinema and Babelsberg Studio, the world's oldest film studio. In Summer 2012 Rahman composed a Punjabi song for the London Olympics opening ceremony, directed by Danny Boyle, part of a medley showcasing Indian influence in the UK. Indian musician Ilaiyaraja's song from the 1981 Tamil-language film Ram Lakshman was also chosen for the medley. In December 2012 Rahman and Shekhar Kapoor launched Qyuki, a networking site which is a platform for story writers to exchange their thoughts. Cisco invested ₹270 million in the startup, giving it a 17-percent share. Qyuki uses Cisco's cloud infrastructure for the site. On 20 December he released the single "Infinite Love" in English and Hindi, commemorating the last day of the Mayan calendar to spread hope, peace and love. Rahman's 2013 tour, Rahmanishq, was announced on 29 July 2013 in Mumbai. Beginning in Sydney on 24 August, the tour moved to a number of cities in India. In January 2016, after a long break A. R. Rahman performed live in Chennai and for the first time in Coimbatore & Madurai, with a complete Tamil playlist. As the name suggests, Nenje Yezhu (which means rise up) began 2016 with a positive note and with music from the heart. The proceeds of this concert will be used for flood relief in Tamil Nadu and also for creating awareness against cancer, supporting VS Medical Trust outside Chennai. He was interviewed by Arnab Goswami of Republic TV on 9 September 2017 for his outstanding achievements. On 15 August 2018, A. R. Rahman appeared as the host in the 5-episode series of Amazon Prime Video titled "Harmony". A. R. Rahman became pioneer by starting India's first YouTube Original that aims to look for the best singing talent from across country. The series has 13 episodes and the first episode was uploaded on 7 November. On ARRived, AR Rahman is the main judge and he is accompanied by Shaan (singer), Vidya Vox and Clinton Cerejo. A. R. Rahman made his debut on silver screen as a super judge with The Voice. The show aired from 3 February on StarPlus. A. R. Rahman partnered with Marvel to compose a promotional track titled "Marvel Anthem" in Hindi and Tamil for Avengers: Endgame (2019). Rahman has sung and composed the track spiced up with rap and heavy percussion. The lyrics are by Nirmika Singh, and MC Heam is the rapper. Skilled in Karnatic music, Western and Hindustani classical music and the Qawwali style of Nusrat Fateh Ali Khan, Rahman is noted for film songs amalgamating elements of these and other genres, layering instruments from different musical idioms in an improvisational style. During the 1980s Rahman recorded monaural arrangements in common with his musical predecessors, K. V. Mahadevan and Vishwanathan–Ramamoorthy. In later years his methodology changed, as he experimented with the fusion of traditional instruments with new electronic sounds and technology. Rahman's musical interests and outlook originate in his love of experimentation. His compositions have an auteuristic use of counterpoint, orchestration and the human voice, melding Indian pop music with a unique timbre, form and instrumentation. With this syncretic style and wide-ranging lyrics, the appeal of Rahman's music crosses classes and cultures in Indian society. His first soundtrack, for Roja, was listed on Time's all-time "10 Best Soundtracks" in 2005. Film critic Richard Corliss said that the composer's "astonishing debut work parades Rahman's gift for alchemizing outside influences until they are totally Tamil, totally Rahman", and his initial global success is attributed to the South Asian diaspora. Music producer Ron Fair considers Rahman "one of the world's great living composers in any medium". I had come to the music of A. R. Rahman through the emotional and haunting score of Bombay and the wit and celebration of Lagaan. But the more of AR's music I encountered the more I was to be amazed at the sheer diversity of styles: from swinging brass bands to triumphant anthems; from joyous pop to West-End musicals. Whatever the style, A. R. Rahman's music always possesses a profound sense of humanity and spirit, qualities that inspire me the most. Rahman introduced 7.1 surround sound technology to South Indian films. On 21 May 2014 Rahman announced that he has partnered with former Black Eyed Peas' Will.i.am to recreate an early popular track 'Urvashi Urvashi'. Track is 'Birthday'. Rahman is married to Saira Banu (not to be confused with actress Saira Banu); they have three children: Khatija, Rahima and Ameen. Ameen has sung "NaNa" from Couples Retreat, and Khatija has sung "Pudhiya Manidha" from Enthiran. Rahman is the uncle of composer G. V. Prakash Kumar, the son of his elder sister A. R. Reihana. Rahman's younger sister, Fathima, heads his music conservatory in Chennai. The youngest, Ishrath, has a music studio. A.R.Rahman is the co-brother[definition needed] of film actor Rahman. Born Hindu, Rahman converted to Islam when he was in his 20s. After the early death of his father, his family experienced difficult times; Sufism influenced his mother who was a practicing Hindu and, eventually, his family. During the 81st Academy Awards ceremony Rahman paid tribute to his mother: "There is a Hindi dialogue, mere pass ma hai, which means 'even if I have got nothing I have my mother here'." He said, "Ella pughazhum iraivanukke" ("All praise to God" in Tamil, a translation from the Quran) before his speech. Rahman is involved with a number of charitable causes. In 2004 he was appointed as the global ambassador of the Stop TB Partnership, a WHO project. Rahman has supported Save the Children India and worked with Yusuf Islam on "Indian Ocean", a song featuring a-ha keyboard player Magne Furuholmen and Travis drummer Neil Primrose. Proceeds from the song went to help orphans in Banda Aceh who were affected by the 2004 Indian Ocean Tsunami. He produced the single "We Can Make It Better" by Don Asian with Mukhtar Sahota. In 2008 Rahman opened the KM Music Conservatory with an audio-media education facility to train aspiring musicians in vocals, instruments, music technology and sound design. The conservatory (with prominent musicians on staff and a symphony orchestra) is located near his studio in Kodambakkam, Chennai and offers courses at several levels. Violinist L. Subramaniam is on its advisory board. Several of Rahman's proteges from the studio have scored feature films. He composed the theme music for a 2006 short film for The Banyan to aid poor women in Chennai. In 2008 Rahman and noted percussionist Sivamani created a song, "Jiya Se Jiya", inspired by the Free Hugs Campaign and promoted it with a video filmed in a number of Indian cities for a cause. A six-time National Film Award winner and recipient of six Tamil Nadu State Film Awards, he has fifteen Filmfare Awards and sixteen Filmfare Awards South for his music. Rahman has received a Kalaimamani from the Government of Tamil Nadu for excellence in the field of music, musical-achievement awards from the governments of Uttar Pradesh and Madhya Pradesh and a Padma Shri from the Government of India. In 2006, he received an award from Stanford University for his contributions to global music. The following year, Rahman entered the Limca Book of Records as "Indian of the Year for Contribution to Popular Music". He received the 2008 Lifetime Achievement Award from the Rotary Club of Madras. In 2009, for his Slumdog Millionaire score, Rahman won the Broadcast Film Critics Association Award, the Golden Globe Award for Best Original Score, the BAFTA Award for Best Film Music and two Academy Awards (Best Original Score and Best Original Song, the latter shared with Gulzar) at the 81st Academy Awards. He has received honorary doctorates from Middlesex University, Aligarh Muslim University, Anna University in Chennai and Miami University in Ohio. The composer has won two Grammy Awards: Best Compilation Soundtrack Album and Best Song Written for Visual Media. Rahman received the Padma Bhushan, India's third-highest civilian honour, in 2010. His work in 127 Hours won him Golden Globe, BAFTA, and two Academy Award nominations (Best Original Music Score and Best Original Song) in 2011. Rahman is an Honorary Fellow of the Trinity College of Music. On 24 October 2014 Rahman was awarded an honorary doctorate from Berklee College of Music during a concert paying tribute to his music featuring an international cast of students. Upon receiving his award he commented that being honored by Berklee illustrates how his life has come full circle, as at the start of his career, he had planned to study at Berklee before being offered the opportunity to score Roja. During his 7 May 2012 acceptance speech of his honorary doctorate from Miami University in Ohio, Rahman mentioned that he received a Christmas card from the family of the President of the United States and an invitation to dinner at the White House. A street was named in his honour in Markham, Ontario, Canada in November 2013. On 4 October 2015, the government of Seychelles named A. R. Rahman Cultural Ambassador for Seychelles in appreciation of the "invaluable services contributed to enhance Seychelles' Arts and Culture development." The following table lists A. R. Rahman's known soundtrack album sales, including Tamil and Bollywood music albums. ^ "AR Rahman Feels 'Happy and Honoured' with Padma Bhushan Win". Daily News and Analysis. Retrieved 29 November 2016. ^ "The 2009 TIME 100 – A.R. Rahman". Time. 30 April 2009. Archived from the original on 17 February 2011. Retrieved 24 January 2011. ^ "A. R. Rahman named in Songlines Tomorrow's World Music Icons'". ARC Music. Retrieved 24 August 2011. ^ Corliss, Richard (25 April 2004). "The Mozart of Madras". Time. Retrieved 5 April 2011. ^ "Hollywood calling Rahman". Hindustan Times. India. 8 December 2009. Retrieved 29 November 2016. ^ "A. R. Rahman opens online store". Deccan Herald. India. 6 December 2009. Retrieved 3 February 2011. ^ Richard Corliss (3 May 2004). "Culture: The Mozart of Madras". Time. Retrieved 3 February 2010. ^ a b c Das Gupta, Surajeet; Sen, Soumik. "Composing a winning score". Rediff. Archived from the original on 15 October 2008. Retrieved 15 November 2008. ^ DUTTAGUPTA, ISHANI (14 May 2017). "How virtual reality pushed AR Rahman towards 'multi-sensory' filmmaking". The Economic Times. Retrieved 13 July 2017. ^ "Why I converted: The transformation of Dilip Kumar into AR Rahman". ^ "Rahman's childhood". hindilyrics.net. Retrieved 19 April 2011. ^ a b c "A R Rahman: In tune with life". The Times of India. 30 September 2002. Retrieved 5 April 2011. ^ Krishna Trilok (18 September 2018). Notes of a Dream: The Authorized Biography of A.R. Rahman. Penguin Random House India Private Limited. pp. 67–68. ISBN 978-93-5305-196-9. Retrieved 7 October 2018. ^ Kamini Mathai (2009). A.R. Rahman: The Musical Storm. Penguin Books India. p. 39. ISBN 978-0-670-08371-8. Retrieved 7 October 2018. ^ Krishna Trilok (18 September 2018). Notes of a Dream: The Authorized Biography of A.R. Rahman. Penguin Random House India Private Limited. pp. 67–. ISBN 978-93-5305-196-9. Retrieved 7 October 2018. ^ "Star-studded 175th b'day for MCC school". The Times of India. 7 October 2010. Retrieved 7 October 2018. ^ "Biography". hummaa.com. Archived from the original on 15 June 2011. Retrieved 20 April 2011. ^ Ganti, T. "Bollywood: A Guidebook to Popular Hindi Cinema": 112. ISBN 0-415-28854-1. ^ "The Secret behind the Allure of A. R. Rahman". Khabar. Retrieved 12 March 2014. ^ "Training under dhanraj master". Indiaglitz.com. Retrieved 20 April 2011. ^ a b "Indian under spotlight". indiansinparis.com. Archived from the original on 22 March 2012. Retrieved 20 April 2011. ^ "Film fraternity hails Rahman, Pookutty for win". The Indian Express. India. 23 February 2009. Retrieved 23 February 2009. ^ Wax, Emily (9 February 2009). "'Slumdog' Composer's Crescendo of a Career". The Washington Post. Retrieved 8 November 2010. ^ a b "How AS Dileep Kumar converted to Islam to become AR Rahman". Dawn. ^ "The Complete Biography of A.R.Rahman". ^ "AR Rahman turns 47". The Times of India Music. Retrieved 21 January 2017. ^ Kabir, Nasreen Munni. A.R. Rahman: The Spirit of Music. Om Books International. ISBN 9789380070148. Retrieved 11 March 2016. ^ a b AR Rahman talks about his Conversion to Islam. Chennai: YouTube. Retrieved 5 April 2011. ^ "Time for A.R. Rahman's 'ghar wapsi', says VHP". The Hindu. 16 September 2015. Retrieved 11 March 2016. ^ a b c d Rangan, Baradwaj; Suhasini, Lalitha (2008). "AR Rahman: The Rolling Stone interview". Rolling Stone. Retrieved 16 November 2008. ^ "A.R.Rahaman – Career". A. R. Rahman – Official website. A. R. Rahman. Retrieved 6 May 2016. ^ Sudhish Kamath. "Look what's brewing". The Hindu. ^ "The Hindu: Breaking News, India News, Elections, Bollywood, Cricket, Video, Latest News & Live Updates". The Hindu. ^ "Tamil Nadu / Chennai News : Study at Rajiv Menon's institute". The Hindu. 5 May 2006. Retrieved 4 February 2012. ^ a b Eur, Andy Gregory. "The International Who's Who in Popular Music 2002": 419–420. ^ Purie, Aroon (1994). "A.R. Rahman: Prodigious Debut". India Today. Living Media. 29 (1–6): 153. ^ "An Interview with A.R. Rahman". Apple Inc. Archived from the original on 8 February 2011. Retrieved 24 January 2011. ^ Culshaw, Peter (6 February 2009). "Interview with AR Rahman, the composer behind the Slumdog Millionaire soundtrack". The Telegraph. London. Retrieved 24 February 2011. ^ John Shepherd (2005). Continuum encyclopedia of popular music of the world. 3–7. London/New York: Continuum. pp. 80–81. ISBN 0-8264-6321-5. OCLC 444486924. ISBN 978-0-8264-6321-0, ISBN 0-8264-6322-3, ISBN 978-0-8264-6322-7, ISBN 0-8264-7436-5, ISBN 978-0-8264-7436-0. Music directors such as AR Rahman and Karthik Raja produce film scores that are more eclectic, incorporating rap, jazz, reggae, hard rock and fast dance beats ( as, for example, for Duet , Kadhalan  and Bombay ). ^ Purie, Aroon (1995). "A.R. Rahman: Music The New Wave". India Today. Living Media. 20 (1–6): 11. ^ K. Naresh Kumar (1995). Indian cinema : ebbs and tides. 26–27. New Delhi: Har-Anand Publications. p. 135. ISBN 978-81-241-0344-9. OCLC 33444588. ^ Purie, Aroon (1996). "Music love birds". India Today. Living Media. 21 (1–6): 195. ISSN 0254-8399. OCLC 2675526. AR Rahman's latest offering is a heavy dose of synthesiser and percussion sprinkled with rap. "No Problem" by Apache Indian is the selling point. ^ Chaudhuri, S. "Cinema of South India and Sri Lanka". Contemporary World Cinema: Europe, the Middle East, East Asia and South Asia. p. 149. Now the South is believed to excel the North in many respects, including its colour labs, state of the art digital technology and sound processing facilities (which have improved the dubbing of Tamil and other South Indian languages into Hindi since the 1970s). ^ Prasad, Ayappa (2003). "Films don't believe in borders". Screen. Archived from the original on 18 December 2008. Retrieved 15 November 2008. ^ Ramaswamy, V. "Historical Dictionary of the Tamils": 199. ^ a b "The "Mozart of Madras" AR Rahman is Performing LIVE in Australia". SBS. 14 February 2017. ^ Purie, Aroon (1995). "French Connection". India Today. Living Media. 20 (13–18): 156. ^ Stafford, Roy. Understanding Audiences and the Film Industry. London: British Film Institute. p. 27. ISBN 978-1-84457-141-3. ^ "The A R Rahman Chat". Rediff on the Net. Rediff. 17 August 1998. Archived from the original on 16 December 2008. Retrieved 6 December 2008. ^ Velayutham, Selvaraj (2008). Tamil Cinema: The Cultural Politics of India's Other Film Industry. p. 6. ^ Ganti, T. "Bollywood: A Guidebook to Popular Hindi Cinema": 112. Rehman became a major star with his hit music in Roja followed by hit scores for Mani Ratnam's and Shankar's films in Tamil. ^ "Film Composer A.R. Rahman Selects Bag End Bass Speakers". Mix. 7 June 2006. Archived from the original on 16 December 2008. Retrieved 18 November 2008. ^ Omkar, Ashanti (March 2008). "Interview with A. R. Rahman". The Score Magazine. 1 (1). Chennai. ^ Maria Verghis, Shana (11 August 2006). "A R Rahman Interview". The Pioneer. New Delhi. ^ "Cine Scope" (PDF). Tamil Guardian. 19 October 2005. p. 7. Archived from the original (PDF) on 24 September 2015. ^ Savita Gautham (23 October 2003). "Chinese rhapsody". The Hindu. Retrieved 5 April 2011. ^ "2009 Just Plain Folks Music Awards Album Winners". Just Plain Folks Music Awards. 2009. ^ "Mover and Shekhar". The Hindu. Chennai, India. 23 November 2007. Retrieved 5 April 2011. ^ "Asian Film Awards 2009". 3rd Asian Film Awards. 6 February 2009. Archived from the original on 10 June 2014. Retrieved 24 February 2011. ^ "A.R. Rahman Picks Up BMI Film Award in London". Broadcast Music Inc. 2 November 2010. ^ "Rockstar's rocking on". The Times of India. 9 November 2011. Retrieved 9 October 2011. ^ "'People Like Us' Soundtrack Features A New Liz Phair Song Penned For The Film + Poster & New Photo". indieWIRE. 14 May 2012. Retrieved 17 May 2012. ^ Kunal M Shah (17 May 2011). "Yash Chopra signs Rahman". Times of India. Retrieved 11 October 2012. ^ Joginder Tuteja. "Jab Tak Hai Jaan Music Review". Retrieved 10 October 2012. ^ "Kadal's audio takes pole position on iTunes". 123Telugu. Retrieved 19 December 2012. ^ "59th Idea Filmfare Awards Nominations". 14 January 2014. ^ "FILM MUSIC NOMINEES". 18 January 2014. Archived from the original on 8 February 2014. ^ "Screen Awards 2014: The complete list of nominees". CNN-IBN. 8 January 2014. Retrieved 8 January 2014. ^ "Maryan Tops iTunes List for 2013". New Indian Express. Retrieved 12 March 2014. ^ "2014 has been a busy year for me: AR Rahman". The Times of India. 31 December 2014. ^ "'AR Rahman's Kochadaiyaan in the nomination list of OSCAR'". moviecrow. 13 December 2014. ^ a b c d "Biography". AR Rahman. Retrieved 12 March 2014. ^ "A.R. Rahman Awards IMDb". ^ "AR Rahman gets nominated for three films in 87th Oscar longlist- Entertainment News, Firstpost". Firstpost. 15 December 2014. ^ "A R Rahman Features Thrice on Oscar Longlist, Sonu Nigam Gets a Spot – NDTV Movies". NDTVMovies.com. ^ http://english.tupaki.com. "Rahman Superb Back Ground Music For Vijay Mersal Movie". tupaki. ^ "A Song for India". India Today. 1 September 1997. Archived from the original on 2 March 1999. Retrieved 5 April 2011. ^ Allen, John; Uck Lun Chun; Allen Chun; Ned Rossiter; Brian Shoesmith. "Refashioning Pop Music in Asia": 67. ^ "A. R. Rahman: Summary Biography". A. R. Rahman: A Biography. November 2002. Retrieved 15 February 2007. Particularly impressed with Vande Mataram, Jeremy Spencer, formerly of Fleetwood Mac stated that Rahman was the only Indian composer he knew about and liked. ^ Salma Khatib (22 September 2000). "Indi-pop: Down But Not Out". Screen India. Archived from the original on 20 January 2010. Retrieved 28 April 2011. ^ "The Making of the Jana Gana Mana". Rediff. Retrieved 5 April 2011. ^ "A. R. Rahman: Summary Discography". A. R. Rahman: Complete Discography. November 2002. Retrieved 5 April 2011. ^ Nydia Dias (17 August 2001). "A R Rahman joins hands with Michael Jackson". The Times of India. Retrieved 5 April 2011. ^ Madhur Tankha (24 August 2007). "Rahman to talk about his Bombay Dreams". The Hindu. Chennai, India. Retrieved 5 April 2011. ^ a b c Iyer, Vijay. "A. R. Rahman". lotr.com. Archived from the original on 25 October 2008. Retrieved 15 November 2008. ^ "Mae goes the raga way". The Hindu. Chennai, India. 20 November 2004. Retrieved 5 April 2011. ^ Chander, Bhuvana (19 April 2006). "Tamil Cinema" (PDF). Tamil Guardian. p. 15. Archived from the original (PDF) on 20 July 2011. Retrieved 24 October 2010. ^ Unterberger, Richie (2006). "Introducing A.R. Rahman: Original Soundtracks From the Musical Genius of Indian Cinema". AllMusic. Retrieved 5 April 2011. ^ "Listen, it's got Connections". The Hindu. Chennai, India. 10 January 2009. Retrieved 5 April 2011. ^ Chris Richards (24 November 2009). "Indian composer A.R. Rahman to perform at state dinner". The Washington Post. ^ "Rahman part of historic remake of We are the World". The Indian Express. 4 February 2010. Retrieved 5 April 2011. ^ "Gujarat turns 50 in style". The Times of India. 2 May 2010. Retrieved 23 August 2010. ^ Ramya Kannan (16 May 2010). "I initially wondered how I was going to do it: A.R. Rahman". The Hindu. Chennai, India. Retrieved 5 April 2011. ^ Lasyapriya Sundaram (28 August 2010). "Rahman's CWG theme song finally released". IBN Live. Retrieved 5 April 2011. ^ "A.R. Rahman Jai Ho Concert: The Journey Home World Tour". A. R. Rahman Official Website. Archived from the original on 5 June 2010. Retrieved 30 November 2016. ^ Sarfraz Manzoor (2 April 2010). "A new level of recognition, legitimacy: Rahman". The Hindu. Chennai, India. Retrieved 5 April 2011. ^ "Bolton Collaborates with Rahman for New Album". Outlook. 10 May 2011. Retrieved 29 November 2016. ^ "Rahman's Sajna in Michael Bolton's album". Sify. 10 May 2011. Retrieved 10 May 2011. ^ Greene, Andy (20 May 2011). "Mick Jagger Forms Supergroup with Dave Stewart, Joss Stone, A R Rahman and Damian Marley". Rolling Stone. Archived from the original on 23 May 2011. Retrieved 22 May 2011. ^ "Mick Jagger's SuperHeavy Supergroup to Drop Album in September". Billboard. 23 June 2011. Retrieved 3 July 2011. ^ "AR Rahman's Punjabi Track To Rock Olympics Inaugural". The Times of India. 30 June 2012. ^ SiliconIndia (27 February 2014). "The Entrepreneurial Side Of Bollywood Stars". SiliconIndia. Retrieved 1 March 2014. ^ LinkedIn. "Qyuki Digital Media". LinkedIn. Retrieved 1 March 2014. ^ Facebook. "Qyuki About Page". Facebook. Retrieved 1 March 2014. ^ "A R Rahman Live – Indian Express". archive.indianexpress.com. ^ Ramanujam, Srinivasa (17 January 2016). "Rahman's musical balm for Chennai". The Hindu. Retrieved 12 February 2016. ^ "Coimbatore's soul lifts up to 'Nenje Ezhu' of Rahman". The Covai Post. 25 January 2016. Retrieved 14 February 2016. ^ Tanvi, P S (3 February 2016). "Saturday Night Live". The Hindu. Retrieved 14 February 2016. ^ "A R Rahman On Nation Wants To Know With Arnab Goswami". www.RepublicWorld.com. Republic Tv. Retrieved 14 September 2017. ^ "Rahman Speaks to Arnab". Hotstar. Hotstar. Retrieved 14 September 2017. ^ "A.R. Rahman: I think Bollywood movie soundtracks are like a motherless child". The Indian Express. 2 August 2018. Retrieved 7 August 2018. ^ Gaekwad, Manish (3 August 2018). "Creating harmony with AR Rahman". The Hindu. ISSN 0971-751X. Retrieved 7 August 2018. ^ a b "Song check: AR Rahman bangs it out in 'Marvel Anthem' for 'Avengers: Endgame'". Scroll.in. 1 April 2019. Retrieved 8 April 2019. ^ Viswanathan, T.; Harper Allen, Matthew. "Music in South India": 139. ^ Slobin, Mark; Gregory Booth; Joseph Getter; B. Balasubrahmaniyan (2008). "Tamil Film Music: Sound and Significance". Global soundtracks: worlds of film music. USA: Wesleyan University Press. pp. 108, 125. ISBN 978-0-8195-6881-6. ISBN 0-8195-6881-3 ISBN 978-0-8195-6882-3, ISBN 0-8195-6882-1. ^ Through innovations such as these, commentators herald Rahman's work as having "passed the relatively static makeup of Western ensembles such as jazz bands and symphony orchestras and the rigid formula of American pop songs." Todd Titon, Jeff; Linda Fujie; David Locke; David P. McAllester. "India/South India". Worlds of Music: An Introduction to the Music of the World's Peoples. pp. 202–205. ^ Corliss, Richard (12 February 2005). "Best Soundtracks – ALL TIME 100 MOVIES". Time. Archived from the original on 20 February 2008. Retrieved 24 February 2008. ^ Smith, Ethan (27 February 2009). "'Slumdog' Remix: The Oscar-winning song 'Jai Ho' is reworked with help from a Pussycat Doll". The Wall Street Journal. Archived from the original on 28 February 2009. Retrieved 1 March 2009. ^ "Baz Luhrrman comments on A. R. Rahman". Charindaa. 2005. Retrieved 15 November 2008. ^ "Rahman's AM Studio introduces 7.1 technology to Kollywood". The Times Of India. 27 June 2012. ^ "A R Rahman's hit number 'Urvashi Urvashi' inspires Will.i.am's new track". Indian Express. 21 May 2014. ^ "I miss him terribly when he's away". Hindustan Times. 28 October 2007. ^ Vickey Lalwani (29 July 2009). "AR Rahman's son sings for Hollywood". Times of India. India: The Times Group. Retrieved 29 July 2010. ^ "A R Rahman's daughter sings song in Yanthram". Indiaglitz. Archived from the original on 30 July 2010. Retrieved 29 July 2010. ^ Kamala Bhatt. "I knew Rahman would go international: Reihana". NDTV. Archived from the original on 16 October 2009. Retrieved 5 April 2011. ^ "Actor Rahman's profile". actorrahman.com. Retrieved 5 April 2011. ^ "Interview with Rahman". Times of India. Retrieved 23 August 2010. ^ "India celebrates Slumdog Millionaire Oscars". The Hindu. Chennai. 24 February 2009. Retrieved 29 November 2016. ^ "Front Page: Great composer, greater human feted". The Hindu. Chennai. 24 February 2009. Retrieved 23 August 2010. ^ Williamson, Nigel (17 November 2006). "The Billboard Q and A: Yusuf Islam". Billboard. Interview with Yusuf Islam; Return to Music. Archived from the original on 14 April 2013. Retrieved 5 April 2011. ^ "Rahman's music conservatory in June". Screen. Archived from the original on 18 December 2008. ^ "Briefly Tamil Cinema". Tamil Guardian. 19 April 2006. Archived from the original on 3 March 2016. Retrieved 30 November 2016. ^ Sudhish Kamath (31 January 2006). "Netru, Indru, Nalai is back with a bang". The Hindu. Chennai, India. Archived from the original on 12 May 2011. Retrieved 5 April 2011. ^ "Rahman advocates free hugs for peace". Daily News and Analysis. 15 December 2008. Retrieved 5 April 2011. ^ "The golden boy of Indian music A R Rahman turns 44". The Times of India. Times Now. 6 January 2010. Archived from the original on 24 September 2014. Retrieved 5 April 2011. ^ "Padma Vibhushan, Padma Bhushan, Padma Shri awardees". The Hindu. 26 January 2000. Retrieved 5 April 2011. ^ Prakash, B.S. (6 July 2006). "Stanford University honours A R Rahman". Rediff.com. Archived from the original on 7 December 2008. Retrieved 16 December 2008. ^ "Limca Book of records felicitates A.R. Rahman". Radioandmusic.com. Retrieved 5 April 2011. ^ "A R Rahman Honored". Indiaglitz. 4 June 2008. Retrieved 5 April 2011. ^ "66th Annual Golden Globe Awards". IMDb. Archived from the original on 14 December 2008. Retrieved 12 December 2008. ^ "More laurels for Rahman". The Hindu. Chennai. 2 April 2009. Retrieved 29 November 2016. ^ "Rahman to be conferred honorary doctorate by AMU". The Hindu. Chennai, India. 26 May 2009. Archived from the original on 4 June 2011. Retrieved 26 May 2009. ^ "Rahman to be awarded honorary doctorate". The Hindu. 3 March 2009. Archived from the original on 3 November 2012. Retrieved 29 November 2016. ^ "India's A.R. Rahman strikes Grammys gold". Agence France-Presse. 2010. Archived from the original on 4 February 2010. Retrieved 1 February 2010. ^ "Padma Bhushan for Rahman, Aamir; Segal gets Padma Vibhushan". Hindustan Times. Retrieved 29 November 2016. ^ "127 Hours gets AR Rahman 2 Oscar nominations". Daily News and Analysis. India. 25 January 2011. Retrieved 25 January 2011. ^ "Rahman gets BAFTA nomination for 127 Hours". Hindustan Times. India: Indo-Asian News Service. 18 January 2011. Archived from the original on 19 January 2011. Retrieved 18 January 2011. ^ "The 68th Annual Golden Globe Award". Golden Globe Award. 14 December 2010. Archived from the original on 25 December 2010. Retrieved 14 December 2010. ^ Ashanti Omkar, A.R. Rahman (13 January 2010). A.R Rahman interview 2010 part 1 – Vinnaithandi Varuvaayaa (VTV) – Thai Pongal special (Web interview). London, UK: Thamarai.com. ^ Hirsch, Mark. "With Berklee Honorary Degree, A.R. Rahman Comes Full Circle". bostonglobe.com. Boston Globe. Retrieved 29 October 2014. ^ "Bollywood Cinema News – Bollywood Movie Reviews – Bollywood Movie Trailers – IndiaGlitz Bollywood". IndiaGlitz.com. ^ "Now a street named after AR Rahman in Canada". 6 November 2013. Firstpost.com. Retrieved 27 November 2013. ^ "A.R. Rahman – Mobile Uploads | Facebook". www.facebook.com. Retrieved 8 October 2015. ^ a b "Making Music Like Ne'er Before". Outlook. 13 March 1996. ^ Basu, Anustup (2010). Bollywood in the Age of New Media: The Geo-televisual Aesthetic: The Geo-televisual Aesthetic. Edinburgh University Press. p. 164. ISBN 9780748643233. ^ a b "Rahman @ 25". CNN-News18. CNN International. 8 September 2017. ^ "Audio tape producers ride crest of Bollywoods music boom, composers become stars". India Today. 30 November 1993. ^ a b c d e f "Music Hits 1990-1999 (Figures in Units)". Box Office India. Archived from the original on 2 January 2010. ^ Surajeet Das Gupta, Soumik Sen. "A R Rahman: Composing a winning score". Rediff. Retrieved 21 September 2002. ^ "A.R. Rahman makes history with record breaking audio cassette sales of his debut film Roja". India Today. 15 January 1994. ^ Kamath, Vinay (25 August 2000). "Gramophone pitch gets louder in the South – Acquires rights for Telugu songs from Sea Records". The Hindu. Chennai, India. Archived from the original on 4 February 2014. ^ a b c d e f g "Music Hits 2000-2009 (Figures in Units)". Box Office India. 5 February 2010. Archived from the original on 5 February 2010. ^ "Film producers float their own music firms". The Times of India. 11 November 2011. ^ a b "Singing a different tune". The Hindu. 3 July 2003. ^ Mathai, Kamini (2009). A. R. Rahman: The Musical Storm. Penguin Group. p. 160. ISBN 9788184758238. ^ "'Slumdog Millionaire' soundtrack sells 2 million units". Neapolitan Music. Retrieved 27 January 2013. ^ a b "Digital music sales up, but labels continue making CDs to publicise films". The Times of India. 11 November 2011. ^ Deshmukh, Ashwini (9 August 2007). "Mashallah: Hrithik learns Urdu". The Times of India. Archived from the original on 21 December 2016. Retrieved 21 December 2016. ^ "'Komaram Puli' audio creates latest record!". way2movies. 16 July 2010. ^ "Bombay Dreams to end". Evening Standard. 24 March 2004. ^ "Sivaji audio – first week report – with statistics". Behindwoods. 11 April 2007. "Malaysian ARR concert success, still leave some fans disappointed". INA Daily News. Allen, John; Uck Lun Chun; Allen Chun; Ned Rossiter; Brian Shoesmith (2004). Refashioning Pop Music in Asia. USA: Routledge. ISBN 978-0-7007-1401-8. Arnold, Alison (2000). The Garland Encyclopedia of World Music. Taylor & Francis. ISBN 978-0-8240-4946-1. Brégeat, Raïssa (1995). Indomania: le cinéma indien des origines à nos jours (in French). Paris: Cinémathèque française. p. 133. ISBN 978-2-900596-14-2. "Cinemaya 1998". Cinemaya. New Delhi (39–41): 9. 1998. ISSN 0970-8782. OCLC 19234070. Chaudhuri, Shohini (2005). "Cinema of South India and Sri Lanka". Contemporary World Cinema: Europe, the Middle East, East Asia and South Asia. Edinburgh: Edinburgh University Press. ISBN 0-7486-1799-X. Cowie, Peter (1994). "Variety International Film Guide 1995". Variety (31st ed.). London/Hollywood: 204. ISBN 978-0-600-58516-9. OCLC 221419104. Eur, Andy Gregory (2002). "A. R. Rahman". The International Who's Who in Popular Music 2002. Routledge. ISBN 978-1-85743-161-2. Ganti, Tejaswini (2004). Bollywood: A Guidebook to Popular Hindi Cinema. Routledge. ISBN 0-415-28854-1. Ramaswamy, Vijaya (2007). Historical Dictionary of the Tamils. Michigan: The Scarecrow Press. ISBN 0-8108-5379-5. Shepherd, John (2005). Continuum encyclopaedia of popular music of the world. 3–7. London, New York: Continuum. pp. 80–81. ISBN 0-8264-6321-5. OCLC 444486924. ISBN 978-0-8264-6321-0 ISBN 0-8264-6322-3, ISBN 978-0-8264-6322-7, ISBN 0-8264-7436-5, ISBN 978-0-8264-7436-0. Slobin, Mark; Gregory Booth; Joseph Getter; B. Balasubrahmaniyan (2008). "Tamil Film Music: Sound and Significance". Global soundtracks: worlds of film music. USA: Wesleyan University Press. ISBN 978-0-8195-6881-6. ISBN 0-8195-6881-3 ISBN 978-0-8195-6882-3, ISBN 0-8195-6882-1. Terska Ciecko, Anne (2006). Contemporary Asian Cinema: Popular culture in a Global Frame. Berg: Berg Publishers. ISBN 1-84520-237-6. Todd Titon, Jeff; Linda Fujie; David Locke; David P. McAllester (2005). "India/South India". Worlds of Music: An Introduction to the Music of the World's Peoples. USA: Thomson Shirmer. ISBN 978-0-534-62757-7. Todd Titon, Jeff (2009). "India/South India". Worlds of Music: An Introduction to the Music of the World's Peoples (5th ed.). USA: Schirmer Cengage Learning. ISBN 978-0-534-59539-5. ISBN 0-534-59539-1. Velayutham, Selvaraj (2008). Tamil Cinema: The Cultural Politics of India's Other Film Industry. Routledge. ISBN 978-0-415-39680-6. Vishwanathan, T.; Matthew Harp-Allen (2004). Music in South India: The Karṇāṭak Concert Tradition and Beyond : Experiencing Music, Expressing Culture. USA: Oxford University Press. ISBN 978-0-19-514591-5. Wikimedia Commons has media related to A. R. Rahman.